My first time camping was my first time camping in Yellowstone. Well, I suppose that’s not entirely true. I did a little camping with my parents and the Boy Scouts when I was a kid, but that’s so many years ago I don’t really recall it beyond the roasted marshmallows, some swimming, and those awesome foil packet meals. I relieved those tasty treats, as well as learning about a few others, while camping recently with my girlfriend in Yellowstone. We stayed at the Canyon Campground, which is perfect for a softy like me. They’ve got regular bathrooms all over the place, along with showers up at the registration building. 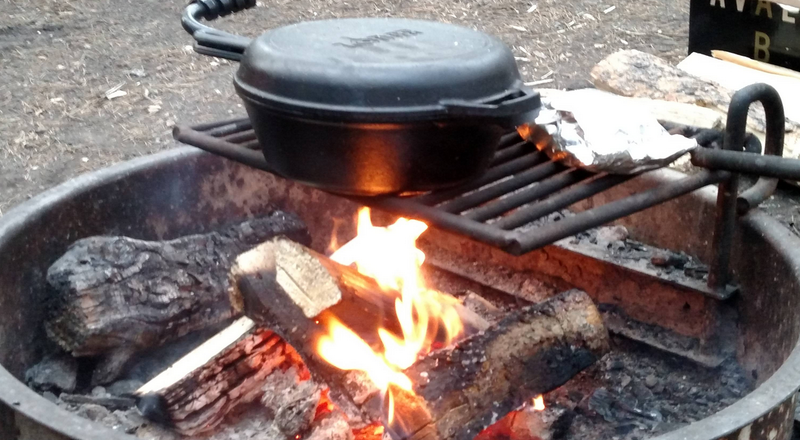 So I never really had to rough it, something I’ve never been particularly fond of and the reason I haven’t gone camping since moving to Colorado 15 years ago. Camping in Colorado is pretty much something everyone does. It’s kind of like skiing. Sure, you can find a person or two who doesn’t do it, but to find someone who doesn’t do either – camp or ski – well, I must be the only person in the state who doesn’t. Or didn’t, rather. After a follow up trip into the foothills, I can now consider myself a camper. And I have to say, I quite enjoy it. At least the cooking out and sitting by the fire and drinking beer part. The running off into the woods to pee in the middle of the night part not so much. But it’s worth it. The other campgrounds in Yellowstone are a bit more primitive in that they don’t have showers, so I chose Canyon for that specific reason. I wanted to be able to bathe daily, especially after hiking. And we did a fair amount of that, walking around Grand Prismatic, the Mud Volcano, Mammoth Hot Springs, and a bunch of other places. Of course none of it was as much as we’d like, but I’m not sure you can ever get there unless you’re a near permanent resident of the park. I’ll likely never move to the area, but I know now that when I return I’ll definitely go back to the Canyon Campground. It’s in such a great spot, right in the middle of the park for easy access to both the north and south loops, that it’s difficult to consider staying anywhere else. Especially for the cost. Even though new lodges are being built, the prices for a room are getting out of control. 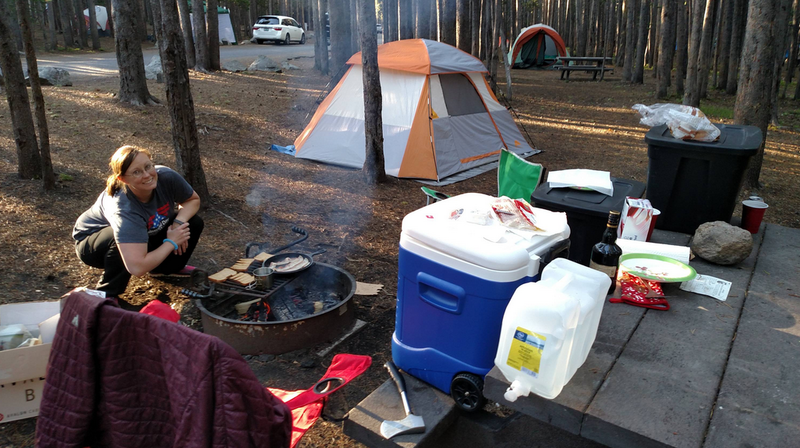 Camping is still affordable, and, as I’ve said, quite comfortable and more than a little fun. I LOVE yellowstone!! That grand prismatic is amazing. it was not that vibrant when I saw it, gotta get back there one of these days!! 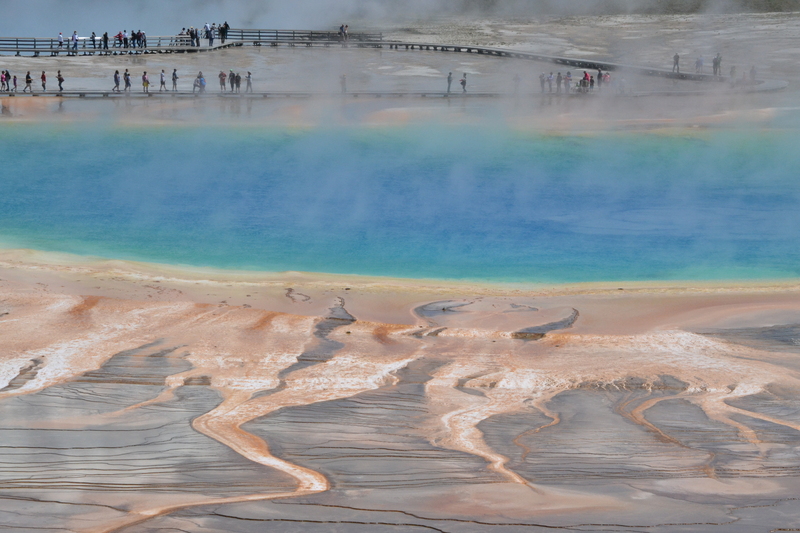 I completely missed Grand Prismatic on my first two visits to the park. The lots were just so crazy busy that I couldn’t find a spot. I’m so glad I made it this time, though! Camping in a place where there is grizzly bears is an impressive first camping experience. You know I was dang sure to put the food away each night!